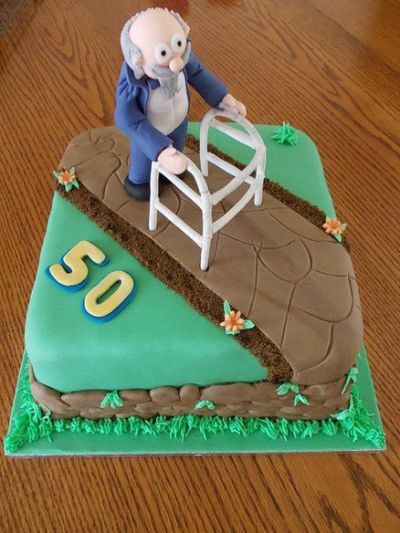 The 50th birthday cake ideas found here give this special occasion the attention it deserves. Infuse your gathering with a little fun by choosing a cake that encourages laughter and joy. 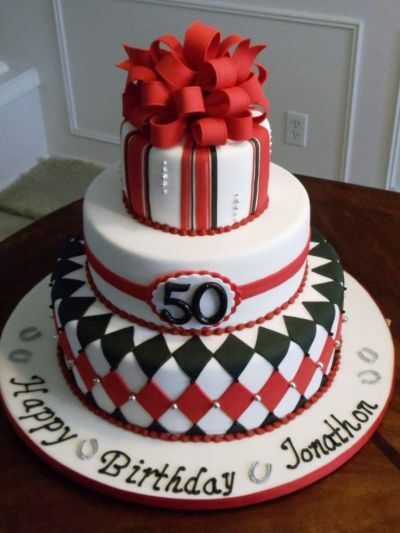 If you prefer a sentimental approach, look for cakes that artfully express a fiftieth birthday in a grand way. Some are funny, others beautiful, but all give that little something extra that makes a birthday cake memorable. 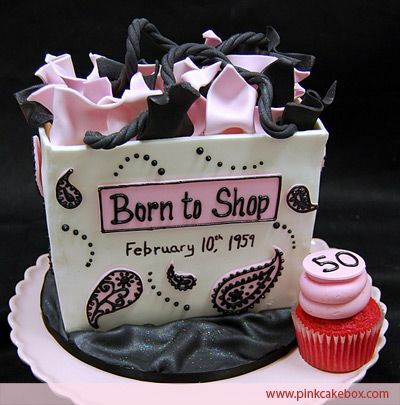 The single most important factor in choosing a 50th birthday cake is honoring the birthday man or woman. What are they known for, do they have a hobby they are passionate about, do they enjoy a good laugh, appreciate beautiful things, and is there a favorite cake flavor. Once you have chosen the creative direction, make the presentation matter. a starring role at your party. For the love of the water. 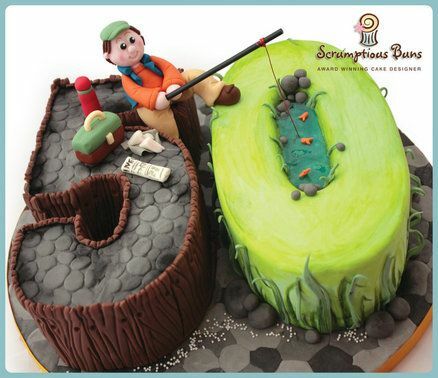 This cake idea peacefully reflects being out on the water. Bursting with bright colors and natures finest features make it perfect for the outdoor enthusiast. 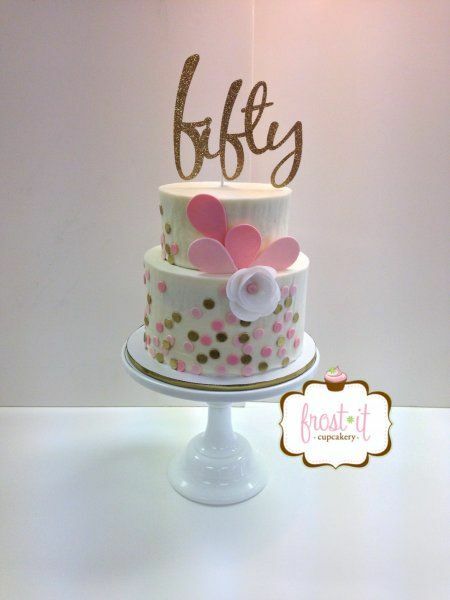 Fabulous is the inspiration behind this 50th birthday cake idea. Here an array of bright and happy colors set the scene for a starring cake presentation. For the man in your life. A taste of fifty for him. Regardless of age, a special birthday cake makes a big impression. This red and black color scheme with a splash of silver is a distinctive decorating idea for the man in your life. For the good old days. There is something about the simplicity of the 1950's that still evokes a happy feeling. 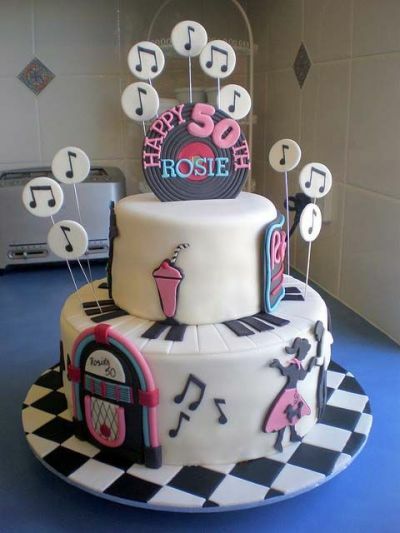 We like the retro look that this cake presents from the poodle skirt to the juke box. 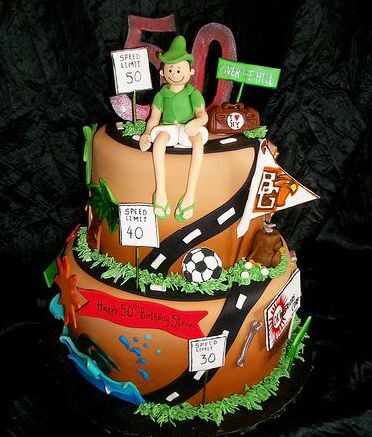 This 50th birthday cake idea keeps things high-spirited and fun, in line with the theme. 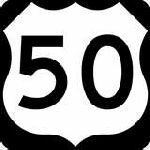 Much like Vegas, what happens at 50 stays at 50. Shop til you drop is creatively captured here-a feast for the eyes as well as the palette. 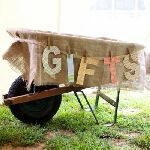 The secret to success lies in capturing the honoree's personality. We love the pink and black paisley design and finishing touches like the tissue paper. Give this flaming cake idea a spin. 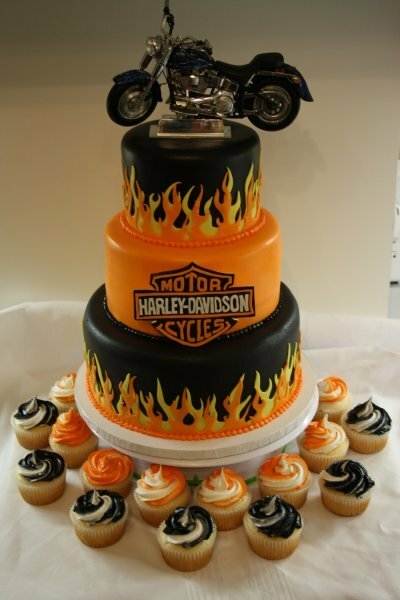 Since the chopper is the star of the cake, the exciting, colorful details bring out the motorcycle lover in us all. 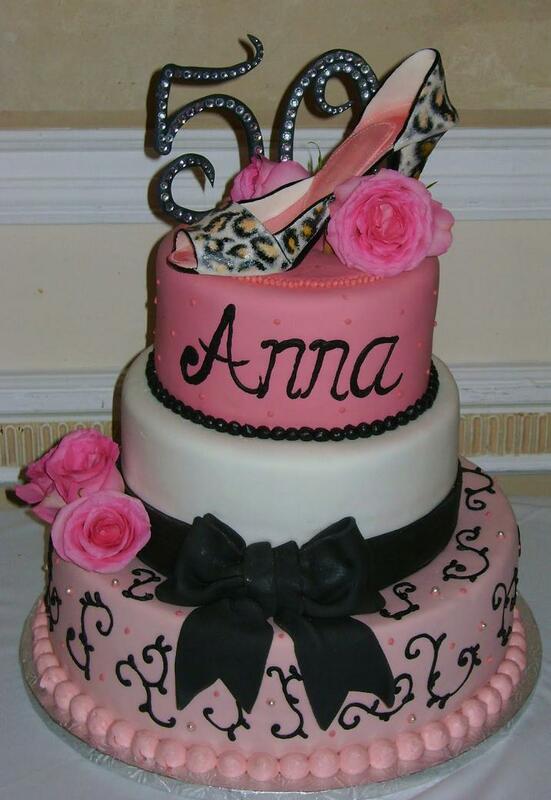 Cake ideas are more stylish than ever, and this idea raises the art of the birthday cake to the highest level of chic. The high heel, pink flowers, and delicate accents all come together in a totally feminine look. 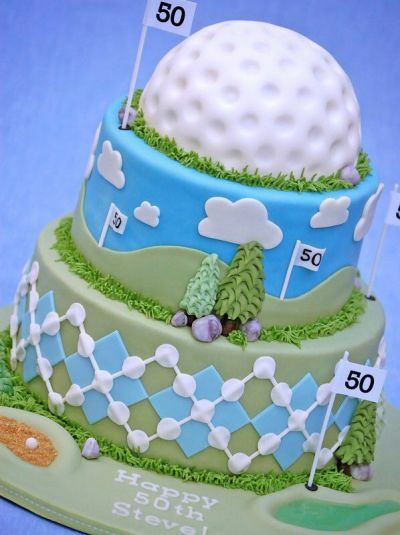 This cake celebrates a 50th birthday par-tee in true golfers fashion. Complementary colors and patterns keep it all texturally interesting. The first signs of aging are cause for celebration, and even doubly so if turning 50. Looking to the future with humor is prettily presented here in a pink and brown color scheme. 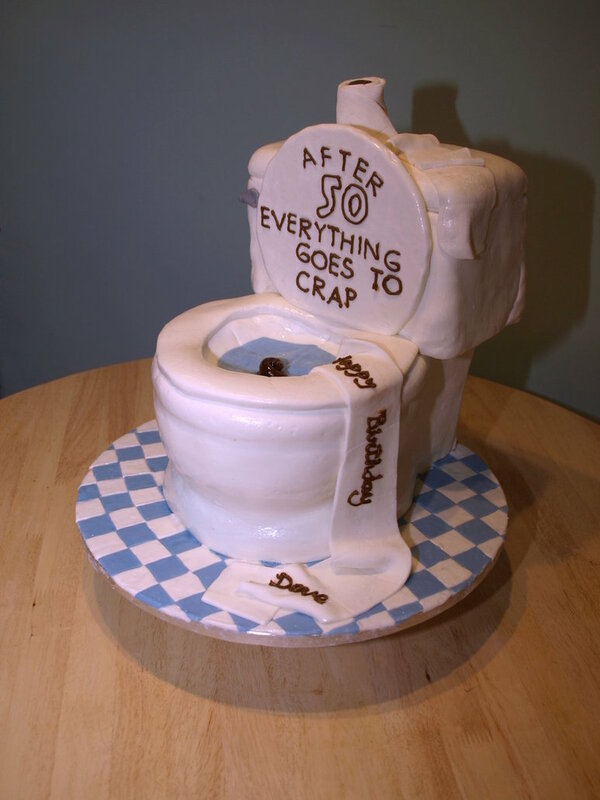 This lighthearted and playful cake idea calls for a birthday boy with a sense of humor. 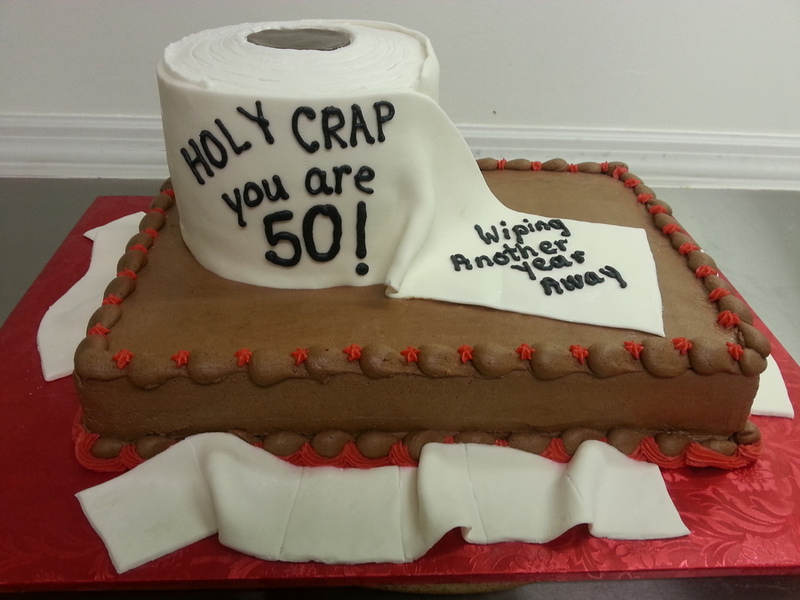 Everyone will get a chuckle out of this 50th birthday cake idea focused solely on age. How much cake do I need? Of course, it all depends on how big you slice it. 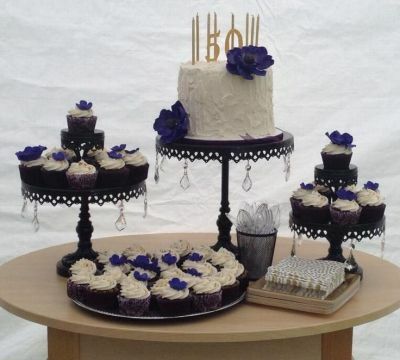 Create a gorgeous grouping of sweets using bedazzled cake stands of different heights and sizes. The striking floral accents complete the overall air of sophistication and festivity. For the sharp dressed man. 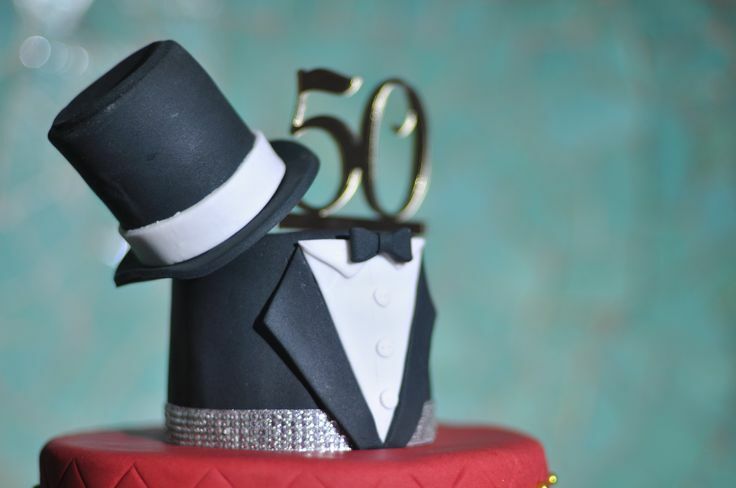 This tuxedo cake showcases 50 at its finest. 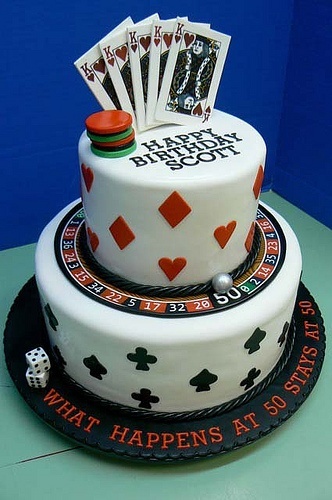 A well-dressed cake in formal attire complete with top hat is a dapper look indeed. Age really is just a number, so why not make the most of it. 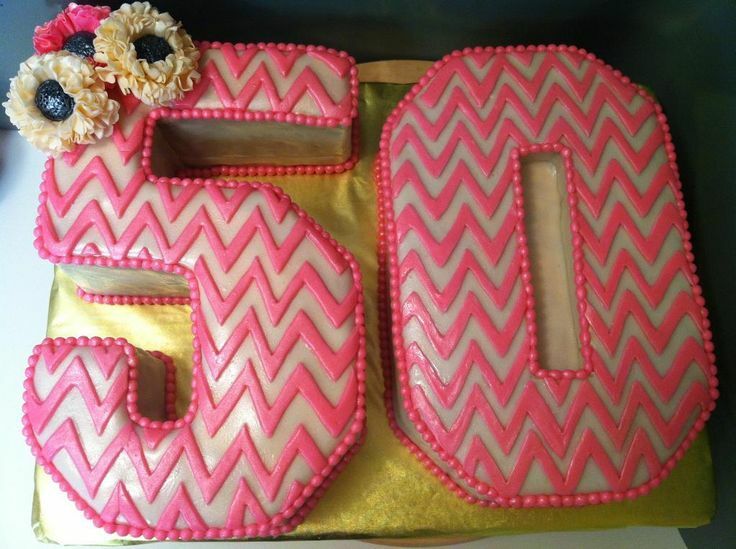 Here, the chevron pattern and floral accents make 50 look so appealing. Fish stories told here...with cake. 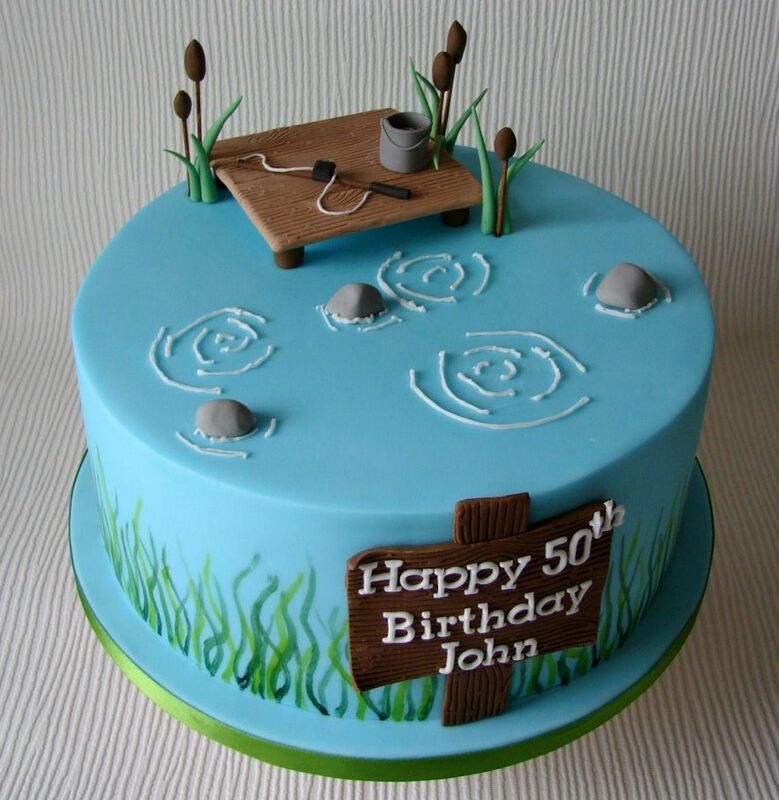 This fishy idea utilizes the big 5-0 to illustrate a beloved hobby in an artfully cohesive way. There is nothing better than seeing eyes light up when a birthday cake like this is brought out. Every detail is such a fun part of the theme that the cake becomes a pot-ty on its own. Better to be over the hill than under it. 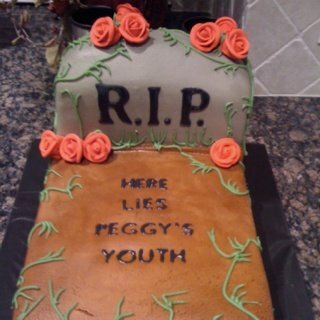 This 50th birthday cake idea provides a final resting ground for fleeing youth complete with headstone and flowers. If your special someone is gifted in music, this cake will strike a chord. 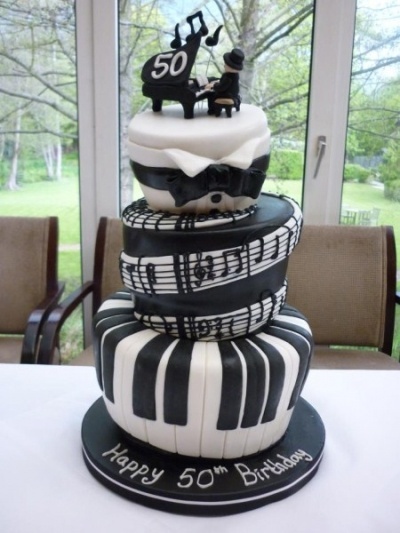 Every detail in this cake design is important and expresses the love of piano to perfection. In a word...hilarious. For those who have stopped pretending that they're okay with growing old gracefully-there is no denying the message here. This 50th birthday sheet cake will delight guests and create a picture perfect memory. The lively use of color adds to the excitement making it a good choice for the age sensitive. Bake your cake and eat it too. 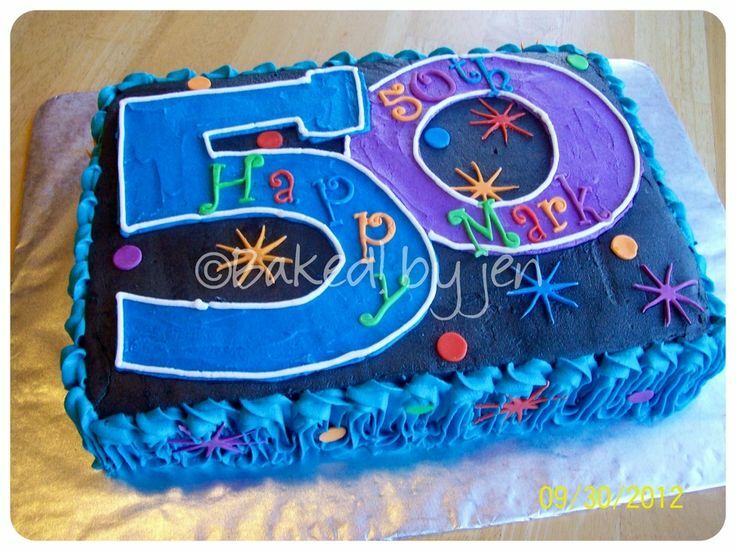 50th birthday cakes for the beginner baker can be simple and easy. Choose a cake mix that is easy to prepare. Since there are two numbers, you can get creative with two different flavors or one favorite. Decorate with sprinkles, candies, toppers, and complementary colors to reinforce your party theme. Serve side by side for the big 5-0. 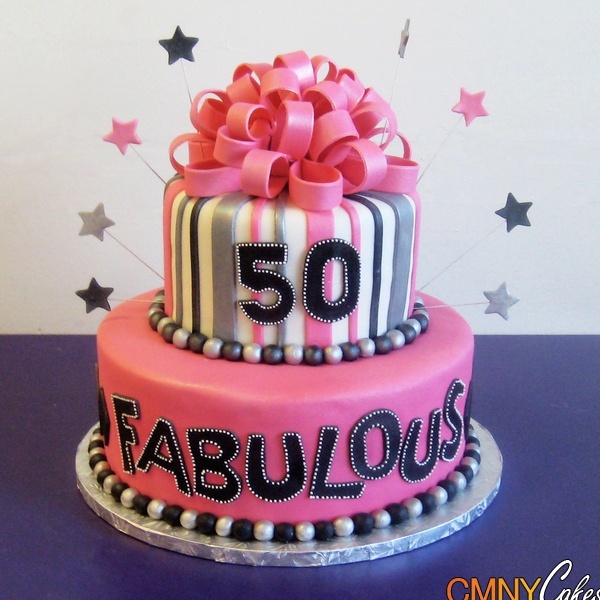 More fabulous 50th birthday cake ideas. Bake 5 cakes, each representing a decade. 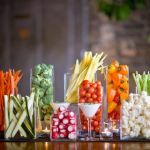 Tempt your guests with different flavor combinations and serve on different styles and heights of cake plates. Weave a pretty fabric around the bases of the cake plates and sprinkle party confetti on the cloth for extra pizzazz. Five favorite cakes artfully arranged together makes a big impression. Elevating your cake creates a stage for the star of your show. Sturdy boxes or pedestal cake plates are great ways to get your cake up off the table and in full view. It can also eliminate the need for a centerpiece. When baking your own cake is not convenient, shop on-line or visit your local bakery. 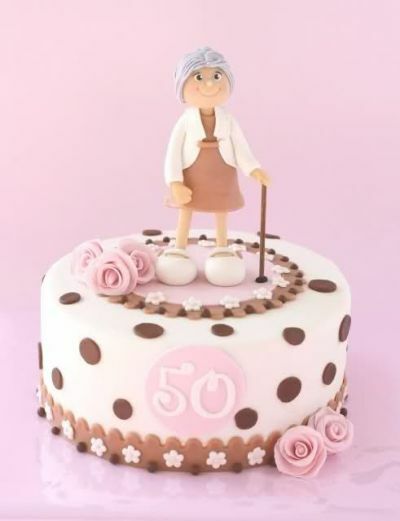 Take advantage of professional help in finding the perfect 50th birthday cake idea. To give the cake decorator a visual picture of colors and theme, provide anything that will aid in achieving the desired look.